Gresham was a commodities trader who built his career on the back of his father’s success as a merchant and crown agent. But the key to this man’s great achievements was his position at Antwerp in the Spanish Netherlands. We bang on about court politics and the desire for war, about religious controversy and social discontent – but the immediate transmission of power was in the market for sovereign debt, just as it is today. In the century after 1530 Antwerp had exclusive control over that market, supplying the courts of Europe with the money and credit needed to keep their governments and armies in funds. By 1566 the city’s population was 100,000, including 10,000 foreign merchants, of whom 600 were members of the English Mercers’ Company. 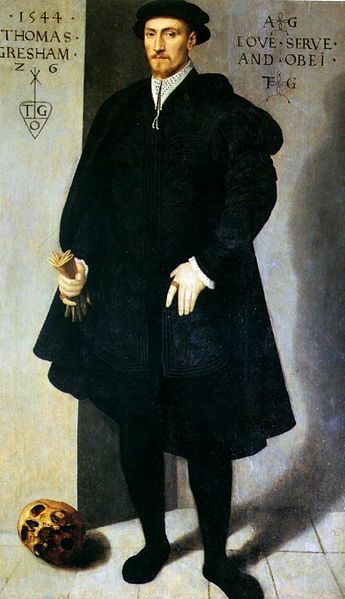 Gresham was appointed agent to the English crown in 1552. He commuted between London and Antwerp and corresponded with the privy councillor William Cecil, thus securing access to the later Tudor monarchs. At his house in Antwerp he wined and dined bankers and great merchants, including the Schetz and the Fuggers. In 1558, during Mary’s reign, he met her husband Phillip II of Spain three times at Brussels, and in the 1560s he was in regular contact with William of Orange. As agent of the crown his role was to borrow money at a favourable price – an interest rate of 14% per annum was the common maximum rate – and then remit the gold and silver to England. His other duties included the gathering of intelligence for Cecil and the bribing of officials, and he was expected to find ways through the many trade barriers in Europe. Gresham also exported munitions, armour and weapons to England. On Elizabeth’s accession in 1558, when protestant rule in England was confirmed and Phillip II had returned to Madrid to take full control of his empire, these exports became smuggled goods – depending on the preferred authority. At this point the Spanish had defaulted on their debts, and in the following decade religious strife in the Netherlands triggered the Eighty Years War. The opportunities were enormous, but at the end of the 1560s Gresham quit Antwerp for London, where he died one of the wealthiest men in the kingdom. So a highly successful man, but what made him great? His outstanding achievement was to raise the credit of the English crown above all its competitors. This became clear in the reign of Edward VI, when other agents scrabbling for credit at Antwerp expressed their resentment at Gresham’s perverse ability to alter the balance of trade in England’s favour while strengthening the value of sterling. Under Queen Mary he fell out of favour, but was recalled pronto when she needed money. During Elizabeth’s reign Gresham is said to have treated the crown’s borrowings as a commercial business, using his discretion, caution and honour to give them stability. When the Antwerp market was roiled by war he helped to wean the crown off foreign credit and convinced English merchants to put up their own funds instead. That’s the official account. But maybe his authority was used to impose financial repression, whereby the sovereign received captured funds at reduced rates, ie. your savings have nowhere else to go. Tricky issue – one that still vexes us on the nature of true power. In any event the ability of the English crown to borrow at relatively low rates was significant and gave long lasting advantages over England’s enemies. In 1557 the Spanish had defaulted for the first time, and this became a cyclical crisis for them, repeating every twenty years or so until the 1640s, when their empire finally cracked. The French defaulted in 1580 and suffered decades of volatile conditions in the money markets. England did come close to bankruptcy at the end of Elizabeth’s reign, owing to a ruinous war in Ireland, but managed to scrape through and hold its gains. Because of Gresham’s careful stewardship – combined with Elizabeth’s parsimony – the English enjoyed good credit well into the 17th century. Or is that true? Just another national myth disguising deeper reasons? Without Gresham would England have been incapable of challenging Spain at sea? Would the strategic position in Ireland have been lost? So much responsibility given to one man, with no clear reason. * Richard Ehrenberg Capital and Finance in the Age of the Renaissance (1928) p.252. Gresham College (funded by a bequest from Gresham’s estate) presents an interesting lecture on Gresham and Antwerp (1h 14m); and another on Making Art in Tudor Britain (1h 02m) – the portrait of Gresham is described from around the 11m mark. Finally, here’s a link to Thier’s Law – the opposite of Gresham’s.